SURE ADAU1701 DSP without input board: work? I would like to purchase the card in question for an active 2-way sub-system. Mainly since I have little space available, can I use the board without the rca input board? 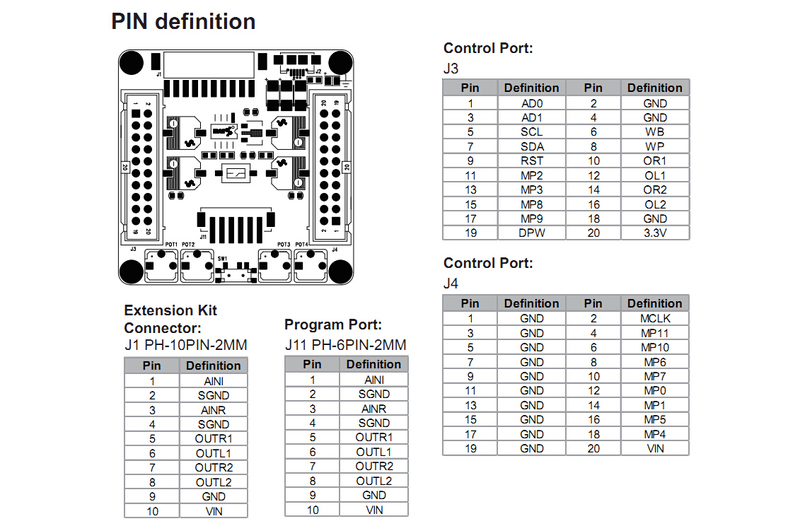 where do I connect inputs and outputs on the board connectors? Do you know the meaning of the various pins? I can not find a pdf of instructions! Here's a wiki Sure DSP Wiki (in German so translate) with pretty much very thing you'd need to know. I suggest reading that to get familiar with its features and how to use sigmastudio to program what it is you're looking to do. To answer your question no you don't need to RCA daughter board instead your inputs and outputs are on the J1 header. AINL and AINR are your left and right inputs while OUTL1 OUTR1 OUTL2 and OUTR2 are your outputs. hello thanks for the tip! in fact it is nice complicated this device, but much better cone functions from the mini dsp! are the outputs at -10db or + 4db? Max input voltage is 2.0 Vrms which gives a max output of 0.9 Vrms. Yes, you don't need the rca interface board. I am using two of these boards with one rca interface board, but using AINR and AINL pins to duplicate the signal to the second board (for 8 output channels).